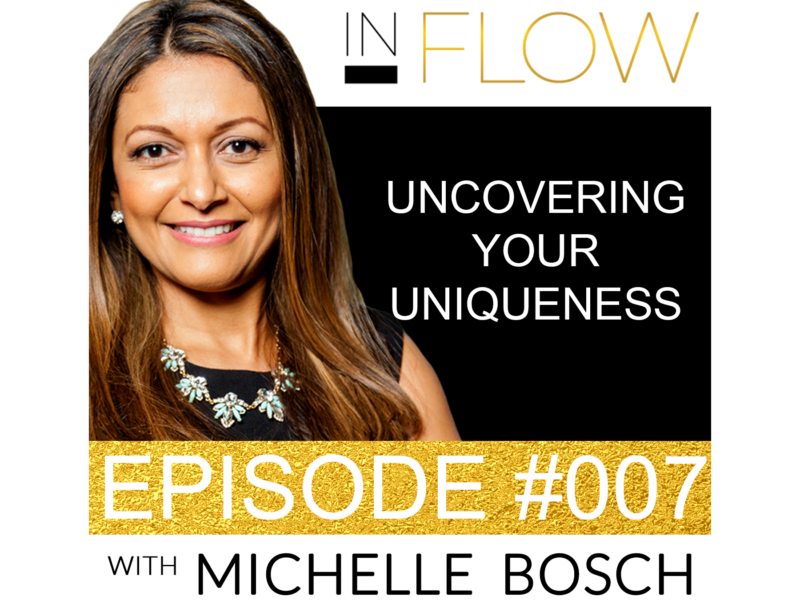 In this episode, Michelle Bosch talks about uncovering your uniqueness and how doing this can take you from excellence to genius. It takes a huge amount of bravery to discover your purpose and oftentimes, people are scared to take an uncompromising stance when it comes to following that purpose. However – what if by moving into your genius, success is guaranteed? 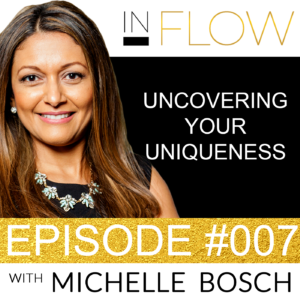 Uncover your uniqueness and discover your true purpose in this amazing episode of In Flow with Michelle Bosch! What if by moving into Genius your success is guaranteed? I think its important to start at the beginning. You and I both started like everyone else does. If you are lucky as I was… At the age of 4-5 you were on your way to Kindergarten of some sort and then thru elementary and eventually high school. If this is the route you took then you went through the traditional schooling system designed for the industrial age. I said earlier that I was lucky…because considering the country where I come from and the high levels of illiteracy in the undeveloped world… I was very lucky to be a girl and have access to the best traditional education we could afford and I am eternally grateful for the excellence that education has allowed me to accomplish. It didn’t come though without some drawbacks. Traditional schooling is a system that encourages sameness and is generally speaking is trying to create similar lives. Its amazing how many people in the Western world live similar lives in part because of this. My experience in this system was that if I was exceptional in one thing and ok in others… I was asked to focus my attention on the things I was not so great at so that I could get stronger in the areas I was weak… but what I have come to appreciate now as an adult and with time and probably you have done the same too… is that we have all ended up creating strong weaknesses by doing this…. and our uniqueness, gifts and strengths have taken a back seat for quite some time and you have been dabbling in the world of excellence instead of Genius. And don’t get me wrong excellence got Jack and I to high levels of success…excellence is where we have proven what we could accomplish BUT a lot of us get stuck here because even for the ego…excellence guarantees accolades and the ego depends on accolade so its important to note that on the larger and more spiritual scheme of things “excellence” is still about dabbling in mediocrity in my opinion. And I get it… the nature of Uniqueness and Genius is unsafe and rebellious so most people chose the illusion of security instead. Back in the beginning of 2011 after experiencing excellence burnout for the first time in my life and where for almost 6-8 weeks I did very little… the question that permeated my consciousness was what is this amazing miracle (that we all are) and in my case called Michelle meant to do in the world, What is God’s vision for me, what I am I built for and what is my uniqueness…what is that Genius that resides in me that is part of the whole universe and fits perfectly like a small piece of a larger puzzle? Somewhere between being a child and growing into an adult that now owned a business I had become swallowed up by my responsibilities and the many compromises I had to make. The result was a life that didn’t allow me space to breathe or create and indulge in my creativity. You might have never experienced burnout but maybe you have asked yourself this question as well before or not but still….I Want to take it a step further by asking… did you know we all have a larger purpose than the immediate one that most people talk about which is to put food on the table and take care of our family? Which are beautiful reasons, purposes and whys for most of us out there….but I also also believe we are here in this universe for something greater and with greater meaning and I wonder if you wonder about What is the biggest vision the universe has for you? When I was asking myself these same exact questions… I didn’t just think about my current skill set at the time to generate x results, but more along the lines of what have my past experiences, intellect, emotions, state of mind and peace, heart, family heritage or lack thereof, frequency, physical body at a cellular level are here to embody and share with others? As a business owner deriving a lot of my identity from being an entrepreneur this process of stripping labels off and peeling the onion was not easy at all. An exercise I would recommend to start this discovery process is to think of about 3-5 people you admire and think about the qualities they embody that make you admire them. This will start giving clues from the outside in and get the process started. So who are you really? Is your Genius still trapped in a bottle? What I know for sure from my own experience is that to begin to deeply and seriously contemplate this question… you will have to break free from the trap of excellence and orienting yourself based on others choices, decisions, looks, results, tactics, strategies, cars, houses, jets, investments, or whatever they may use to market or posture themselves to impress others. Some people just know what their purpose is from an early age because their creative energy and enjoyment in a specific area is just so palpable…for me…it has been a true uncovering, unlearning, and peeling back the layers in a butterfly fashion going from flower to flower or from experience to experience that has brought slowly more self awareness and now in hindsight its become easier to see some of the dots and connect them. So I want to urge to Take the leap of faith and even if all dots don’t connect and you have glimpses of the tree so to speak, start stepping into Genius and little by little start planting seeds…the smallest seeds with the biggest trees take time to germinate so start moving…start working on the things you love and the mirror will become clearer and clearer for you to be able to unleash your Genius…it’s in the brink of what you consider insane right now….but It’s exquisite and mainstream will look at you with a mixture of both fear and awe because our society idolizes it even though it considers it risky. I think this is one of the reasons why Uniqueness and Genius is usually only accepted in the arts, fashion or music. The natural flowering so to speak of your uniqueness is organic and full of unpredictable energy and that’s why as much as it is revered by society it is also considered dangerous, eccentric or quirky. Genius is lately for me emerging naturally in a spontaneous way and it is at the cutting edge of creation…so what am I trying to say in plain English is …embrace your weirdness and shine brightly… don’t devalue, undervalue or withhold your Genius…go the path less traveled….it will lead to treasure I promise! Give yourself permission to dream as big as possible because What if by moving into Genius your success is guaranteed? Also in Brene Brown’s latest book which I highly recommend “Braving the Wildness : The Quest for True Belonging and the Courage to Stand Alone.” she writes…”True belonging is the spiritual practice of believing in and belonging to yourself so deeply that you can share your most authentic self with the world and find sacredness in both being a part of something and standing alone in the wilderness. True belonging doesn’t require you to change who you are; it requires you to be who you are.”Give yourself permission to dream as big as possible and be You. I look forward to spending time with you in the next episode. Thank you!